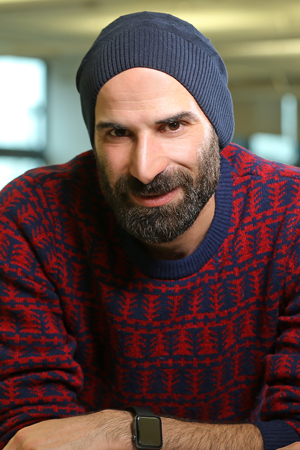 Farshid Manafi is a 38 year old Persian host and producer, who left Iran in March 2010 and joined Radio Farda – the Persian service of RFE/RL in Prague, Czech Republic. Farshid has a vast experience in Theatre, Voiceover, Dubbing and Radio and was a famous host of several radio shows on Iranian state radio and has been a well-known Iranian personality for past 18 years. Under the constant watchful eyes of Iranian censors and officials, he pushed the limits on critical satire by his lively programs, until his last show was shut down 9 years ago. Banned from Iranian airwaves, Farshid joined RFE’s Iranian Service Radio Farda and created “PasFarda” (Farsi for ‘The Day After Tomorrow’), which has been on-air five nights a week for 6 years. A satirical production skewering both political and social mores inside Iran. The show had a complete satirical-comedy tone and style. The content was mainly based on comedy news genre, enriched with satirical presentations of events, personalities and phenomena – mostly centered in Iran. Often, contradictions between official policies and actual actions of officials were highlighted with critical satire. The show has ended by its thousand’s episode in 2016. He has been named “International Radio Personality of the Year” by the Association for International Broadcasting (AIB) in 2011 in London. He was also the winner of “On Air Talent/Radio Personality” and “On Air Talent/Humor” Communicator awards in 2014. Nowadays, Farshid hosts a new production – “The Thursday Station” which is a live show that is on air once a week on Radio Free Europe – every Thursday for four hours. It holds the same concept as “PasFarda” show based on political and social news inside of Iran.